Stainless with premium #4 polished shelves and decks in durable 16 gauge. 1-1/2" stainless corner angles (Model YB only), and stainless caster mounts with “twin caster hole pattern" to mount various sized casters. Bolt on casters, 2 swivel & 2 rigid, for superior tracking. Tubular handle with smooth radius bend for comfort and uniform appearance -30" handle height above platform (XP & YP). 1-1/2" shelf lips down (flush) for easy loading. 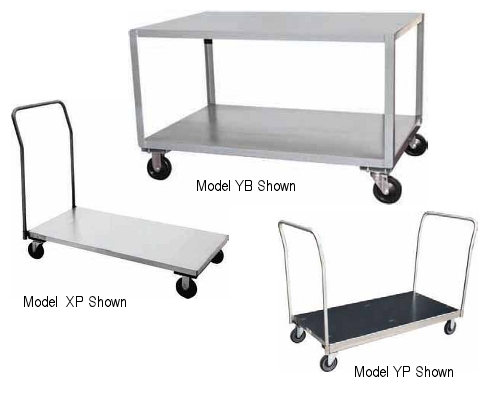 Other shelf heights available (Model YB only) — specify.